Biocompatible fibers are no longer a myth. Thanks to the efforts of MIT and Harvard Medical School researchers, who have developed a biocompatible fiber, which will soon be helping in the detection of early signs of tumors. The fiber is composed of hydrogel material and behaves as an optical fiber. It has been designed so to carry out therapeutic light pulses to the target tissues to trigger the rate of recovery. Made up of biopolymers and hydrogels- they are stretchable and are expandable upto seven times of their length and are also compatible for biological implantations. All these properties make them a suitable long lasting implant that matches body tissue flexibility and doesn’t break down. The working of these fibers is based on an advanced domain of science, known as Optogenetics. It involves delivering light pulses to the target tissues, especially neurons using optical fibers, having core diameter as small as that of a needle. Brain, being a highly sensitive organ, can’t deal with optical fibers, which are, generally, made of glass. However, these new fibers with highly elastic and stretchable properties could be a key in making things successful. Xuanhe Zhao, Professor of MIT’s Department of Mechanical Engineering, believes that if these fibers attains the required flexibility level, they could be fruitful in implementing long-term therapeutic effects. Zhao’s and his team, comprising of graduate students - Xinyue Liu and Hyunwoo Yuk, are one of the contributors behind this research. They have expertise in altering the mechanical properties of hydrogel and are responsible behind making it stretchable and pliable. Another group is led by Associate Professor Seok-Hyun Yun, Harvard Medical School, who shares expertise in synthesizing bio-optical fibers made of hydrogels. 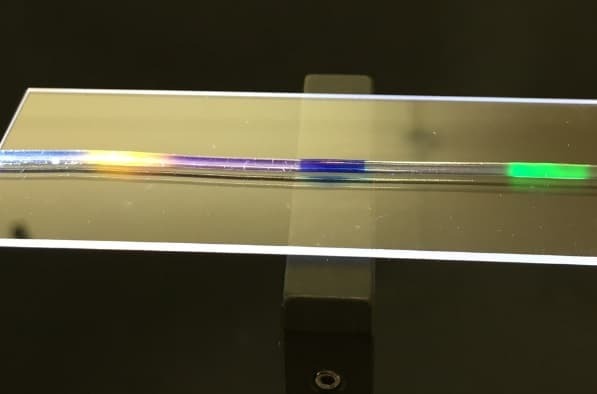 Their combined effort led to the fabrication of this new fiber which shared both stretchable and optical properties and carried light from a laser source with negligible attenuation. The next giant leap included loading the fibers with organic dyes. Red, green and blue colored organic dyes are placed in a specific position around the fiber and were subjected to the laser light. It was noticed that the intensity of the red light which was received at the end was directly proportional to the amount of light being absorbed by the red dye region when subjected to tension. Thus, researchers obtained a way to locate the region and the amount of stretching subjected to the fiber by analyzing the output light intensity, making it an effective strain sensor. Researchers believe that implanting such fibers in the locomotive parts of the body will let them monitor patient’s mobility. Further, these sensors can prove vital in detecting early signs of tumors, cancers and can help in implementing optogenetic therapies. Appreciated by many fellow researchers, this research is gaining likes from almost everybody who belongs from the similar community. It has recently been published in the journal Advanced Materials and is funded partly by the National Institutes of Health and the Department of Defense. Researchers are now set to analyze and study more properties of these fibers to make them more accurate to the properties desirable, and to make them available for live field testing.